This article discusses how to install a VPN on your Chromebook. For a full discussion on why you want to use a VPN on your Chromebook and which Chromebook VPN you should choose, please see 5 Best Chromebook VPN Services. 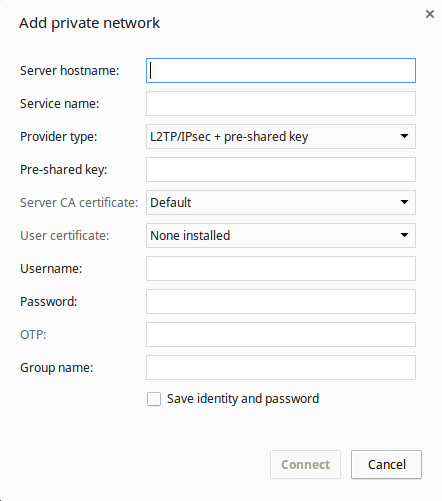 Use the L2TP/IPsec client built into Chrome OS. Use a Chrome browser add-on. Use an Android app (on Chromebooks that support this feature). Only an L2TP/IPsec connection will protect your entire Chromebook if you use Android apps. A Chrome browser add-on will protect your regular Chromebook activity but not Android apps, while an Android VPN will only protect other Android apps. These instructions assume that you have already signed up for a VPN service. In theory, Chrome OS supports the OpenVPN protocol, but it has never been able to properly import regular OpenVPN certificates. If running your own VPN server then it is possible to configure it and your Chromebook to connect via OpenVPN, but that is beyond the scope of this guide. The built-in L2TP/IPsec VPN client is the “standard” way to run a VPN on Chromebooks. It is therefore handy that most VPNs support this protocol! Note that L2TP/IPsec settings are the same across platforms, so even if a VPN does not support Chromebooks explicitly, you can use the L2TP/IPsec settings provided for any other platform to run a VPN on your Chromebook. PPPT is no longer supported by Chrome OS. And since PPTP is not a secure VPN protocol, there is very little reason to use a PPTP VPN on Chromebook anyway! If you have a legacy Chromebook and really must use PPTP, the instructions for doing so are almost identical to those below. 1. Sign in to your Chromebook. 2. Click the network icon at the bottom of the screen (next to your picture). 4. Select Network -> Add connection -> Add private network. 5. Fill in the details provided by your VPN service (as noted, these don’t have to be specific to Chrome OS, so you can just use generic ones provided for other platforms). To view the VPN status and to connect/disconnect, go to Settings -> Network -> VPN. 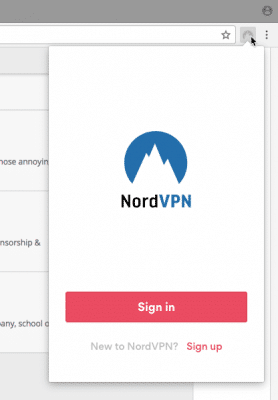 Android VPN apps will only protect other Android apps on your Chromebook - not the Chrome browser. Using them requires having a Chromebook that supports the Google Play Store and Android apps. This usually means having Chrome OS version 53 or newer. If your Chromebook can run the Google Play Store but it isn’t already installed, please follow these instructions to install it. Then just open the Play Store and download and install a custom VPN app like any other app. You’ll almost certainly be asked to sign in using the credentials established when you signed up for the VPN service, although many Android VPN apps offer a short free trial. Alternatively, you can manually set up OpenVPN using OpenVPN for Android or OpenVPN Connect. Full instructions for setting up OpenVPN for Android can be found in How to Install a VPN on Android, which also has instructions for configuring the app to act as a kill switch. There are various workarounds to get Android apps onto Chromebooks that don’t (or don’t fully) officially support this feature, but that is beyond the scope of this article. With Chrome OS the browser is the operating system, so Chrome browser VPN add-ons can in effect act as true VPN clients. That is, apart from the fact that newer versions of Chrome OS support Android apps. These run on their own separate Android subsystem, and won’t benefit from a Chrome VPN browser add-on. Most such browser add-ons securely encrypt the connection using HTTPS. It is always worth checking that this is the case with your VPN provider, however, as some have no encryption at all. These may still be useful for spoofing your location but provide no security or privacy benefits. 1. Open the Chrome Web Store. Ensure the Extensions button is selected and search for the VPN add-on you want. Alternatively, your VPN provider will likely provide you with a direct link to its Chrome extension download page. 2. Click Add to Chrome or click on the blurb to bring up a detailed description of the extension. Then click Add to Chrome -> Add Extension. 3. 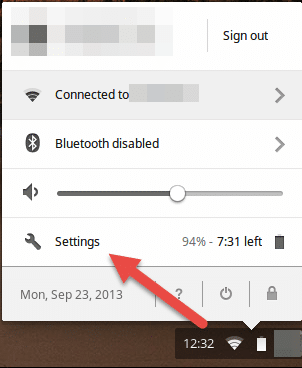 An extension icon will appear in the Chrome taskbar. Just click on it to open the VPN add-on. 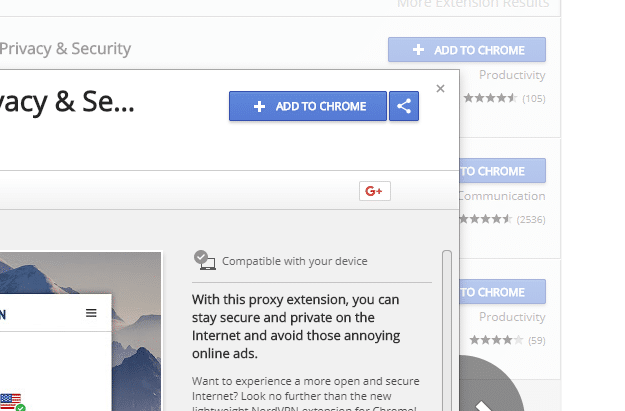 Remember that a Chrome extension will only protect what you get up to inside your Chrome browser. It won’t protect Android apps. Rather than installing a VPN on your Chromebook, you can install it on your router (depending on which router you have). Many modern routers have a VPN client built in, which you can usually configure via the router’s admin page. You can also flash routers with third-party firmware such as DD-WRT and Tomato, which include a VPN client. Indeed, some providers offer pre-flashed routers that have been pre-configured for their service. For a full discussion of the pros and cons of this, please see Five Best VPN Routers. We also have a guide to setting up OpenVPN on DD-WRT routers here. Almost all VPN services support L2TP/IPsec, which makes using a VPN on your Chromebook very easy. Using a Chrome browser add-on is arguably even easier if you don’t also need to protect Android apps running on your Chromebook. Image credit: By Konstantin Savusia/Shutterstock.